The opening to the tempest - the year after and in a different school! We have never done the Shakespeare Schools festival before but I have heard great things about it. Be sure to check it out for how it works - getting kids to perform Shakespeare on stage is surely something that they will never forget. 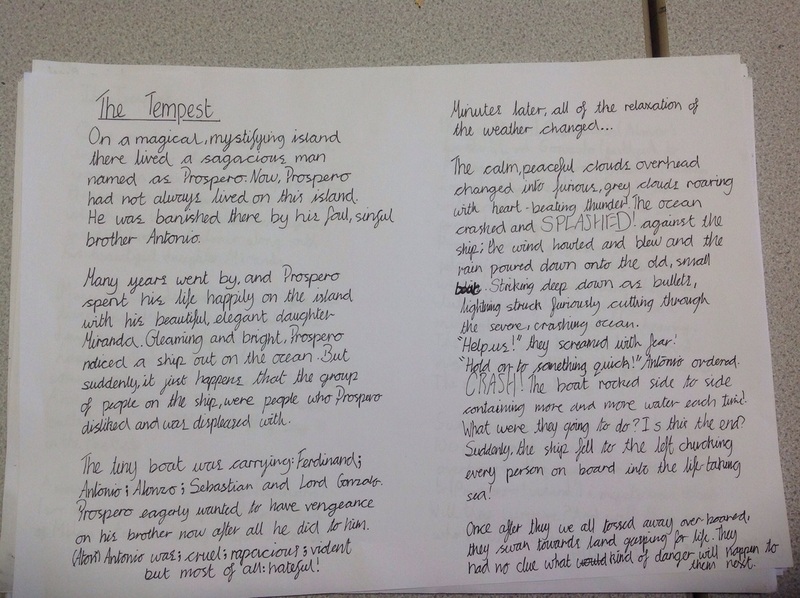 In our class we are currently building up to Shakespeare week by reading The Tempest and finding out about the characters. 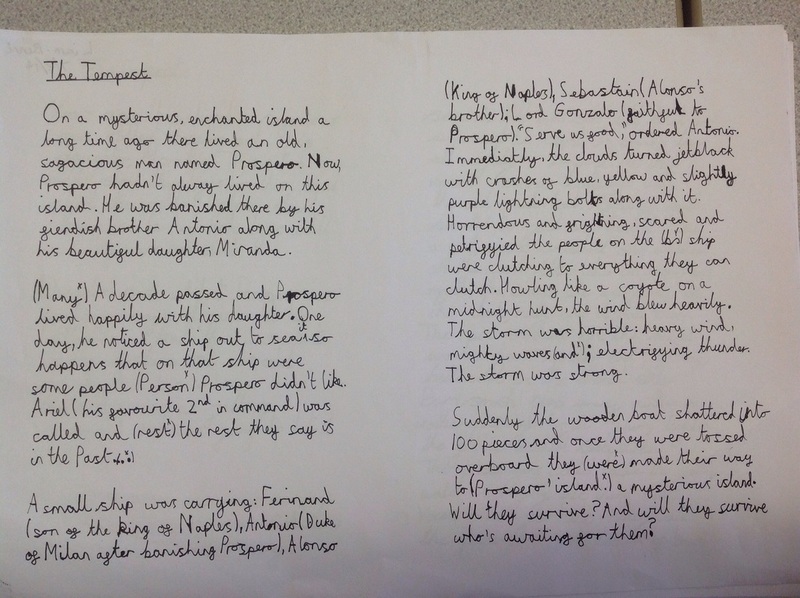 Prior to this all children were set the task of reading the story and finding out about William Shakespeare last half term as part of their half termly learning logs (See previous post on these). 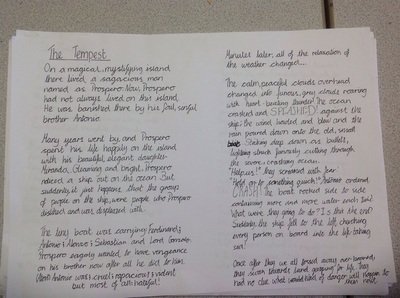 Just in case you don't know the story of The Tempest it basically starts with a ship cast off in stormy seas. For my writing tomorrow we are going to use some stormy music to create the scene. All tables will be pushed away and the children will dramatise being at sea during the storm. For this part we will use the ideas from "A Practical Guide to Shakespeare for the Primary School" by John Doona. This book all revolves around building children into the play and understanding it through different drama techniques and is something quite special. If you are thinking of doing Shakespeare in a Primary School I highly recommend it. (I'm not on commission!) I'm not going to share the ideas we will be using in class as they are taken from the book but we will basically be acting out each part of the scene - the weather, the boat, the people. This will get the children to think about all the different things that are happening. By getting the children to act out different parts of a storm I am hoping that they will use these different scenarios to describe what the Tempest is like at different points. Although they will not be writing this in the first person, they will have the ideas to write about. Because we are writing a description we will also listen to the video at the bottom of the page for ideas of sounds that we might hear when the storm is taking place. Note: - there are so many videos to choose from with story weather sounds - this is just one of them! As well as the sounds, we will also be describing how the people are feeling - what the waves, boat etc are doing and looking like too. I will add pictures of work completed when they are completed tomorrow. 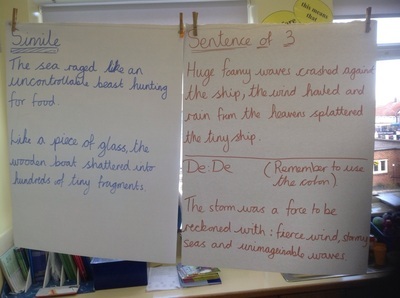 As it is to be a descriptive piece of writing we will be using a vast range of Alan Peat Sentence types taken from his awesome exciting sentences books. If you don't own them and are not using them you must be mad! Just another fabtastic writing idea. If you like - please share and comment. 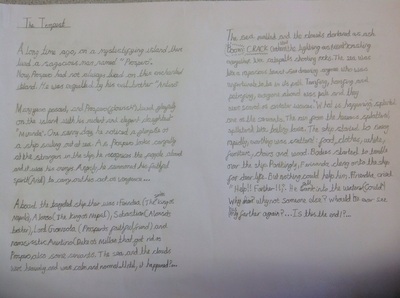 Some of our awesome writing is below the video we used. 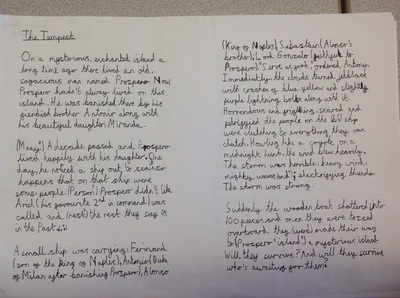 Last week we began a five week Fabtastic Friday writing project which will eventually culminate in the children having rewritten The Tempest in their own words from start to finish. Silence in the classroom, children lying on the floor, eyes closed. You've landed on the island after swimming for what seems like an eternity. The sand feels (cold/warm) under your worn out body. How are you feeling? You are all alone and can see no other passengers from the ship. Think about what the first thing is you can hear. Children to think of one thing that they might hear on the island and to make that sound quietly. All children making their own sound will hopefully make the sound of the island in their own unique way. Children to keep eyes closed and to listen to all the sounds that each person is making. Children must continue to make their own sound but listen to all the others carefully. (At the same time, I could be playing a sound effect loop). Stop the sounds and invite the children to discuss which sounds would be continuous and which sounds would be intermittent. Then restart again. Children to once again listen carefully. Immediately after this get the children to write some Fabtastic sentences about what they could hear. 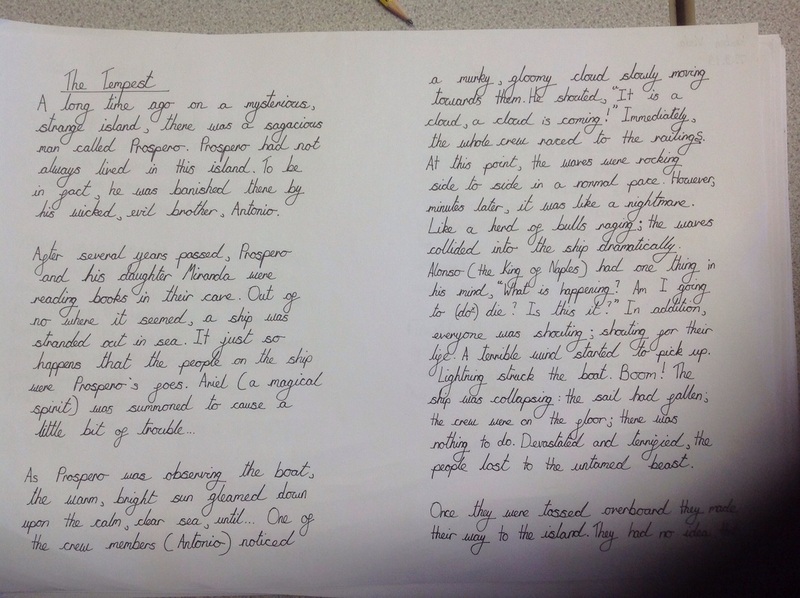 Use a variety of Alan Peat sentence types to describe the scene. Modelled sentences like this for the children to use and leave on display. Allow a short amount of time for this as this is only the first part of the second scene. Model a linking sentence that will help to link the sounds from the beach to the sights and sounds of the actual Island. 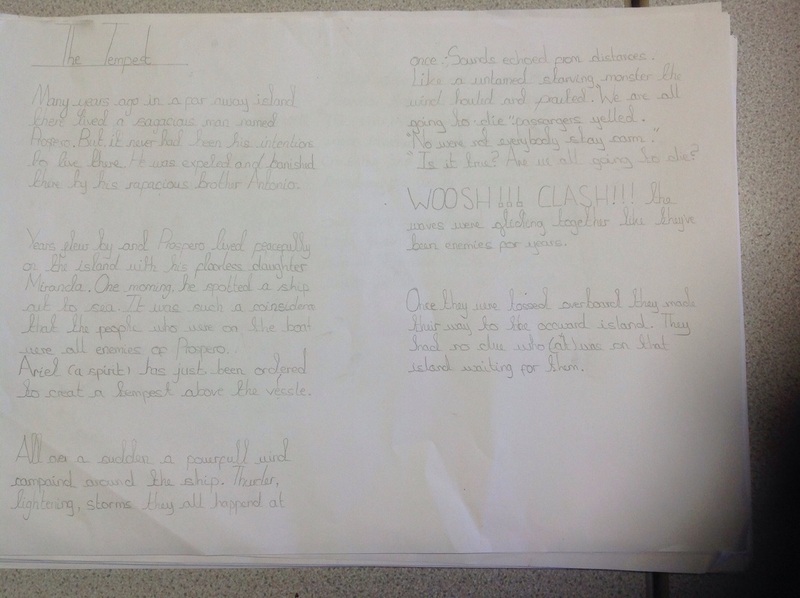 After modelling, we will dramatise the actions with children writing and then showing how their character will move from the beach to the Island itself. Exhausted, Ferdinand trudged off the beach. He couldn't believe what was in front of him. Walking slowly, Fedinand came across some sights he could not believe. Following this we will use 'Epic Citadel' to explore an uninhabited Island. 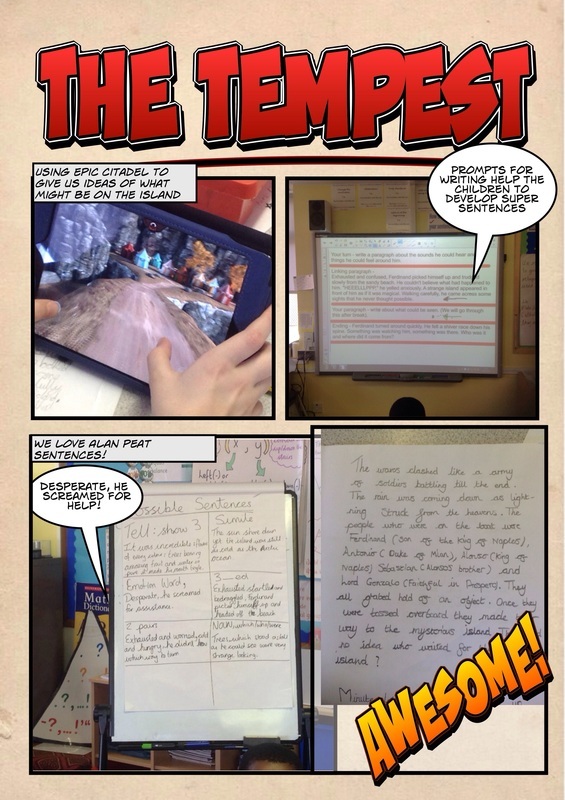 Following the initial writing of the sounds they could hear, the children will use the Epic Citadel APP to explore the sights and we will use a slow writing process to write about the weird Island. At no point will we talk about who is inhabiting the island as that will come next week! He felt like someone was watching him. A tingle went down his spine. Who was there? Who was watching? What is this Island? Last week saw Ferdinand wash up on the magical island inhabited by Prospero and Miranda. He begins to explore the island looking for food and water until he hears something. 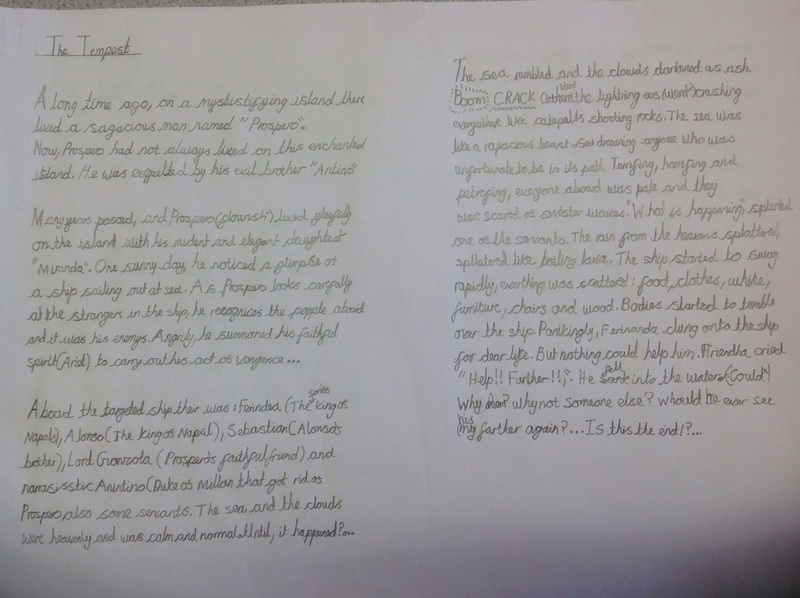 Prior to writing we will discuss what has happened so far and what we know about each character to help us develop a character profile for each person in the play. Meanwhile on another part of the island Ariel (the spirit) finds his master Prospero. What conversation do you think they might have had? Children to role play the possible conversation between the master and the spirits what might they talk about? What has happened in the story between the two? What is the history of the island and why is Ariel working for Prospero? Would this have an impact on the conversation? Children will be reminded of the rules for writing a conversation within a story. They will also be reminded to not just write the conversation but to include other details such as what is going on around them etc. Ariel and Prospero had a conversation regarding the storm that raged and discussed the fact that Propsero was the one who released him from the evil witch Sycorax and so Prospero makes him do one last task before his promise of being set free is completed. Children to take turns being Prospero and Ariel and to then showcase their conversations with each other in the class. Ariel travels and arrives back to Ferdinand. Ariel guides Ferdinand through different parts of the island until they reach a clearing where Prospero and Miranda are sitting. The children will use their great knowledge of descriptive writing to describe the journey through the island while also describing the spirit and Ferdinands feelings. The children followed up their amazing writing with some great artwork. Using black card with charcoal and pastels the children thought a lot about what they wanted their storm to appear like. 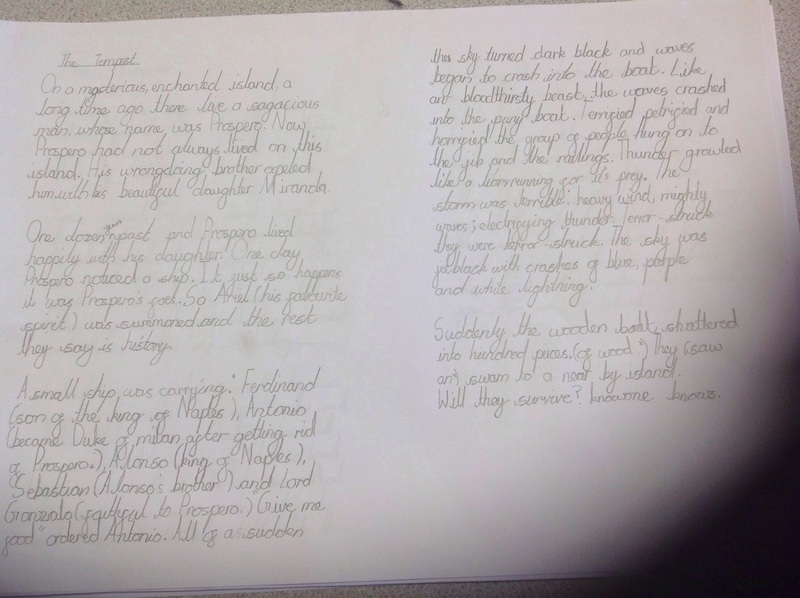 A writing project we undertook to enable the children to enjoy William Shakespeare while at the same time re-writing his play and creating some great artwork around it.